Happy New Year, San Diego! And what better way to bring in the new year than with a call to refresh our eyes, minds and souls through nature! Karen Eastman brings us honor as our 11th feature artist because of her work which beautifully expresses humanity's awesome connection to nature. Focusing closely on such subjects as rocks, mountains, trees, sunlight, and wind, Eastman's pieces exhibit a wonderful blend of exuberance and cool mystery. Eastman works largely in oils, and her painting River Rock is a great example of her style and themes. The piece attracts the eyes at first glance with its interesting contrast of uniformity and difference. 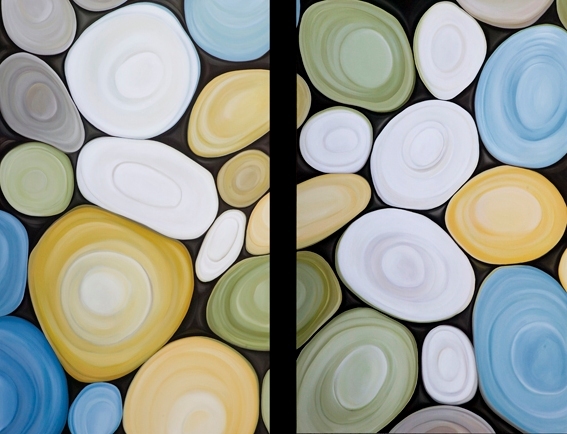 The tasteful arrangement, contours, and coloring all harmonize in a way that gives viewers a sense of the way the rocks would feel in one's hand. The piece is less an attempt at realism than a meditation on the miracle of the physical world. The snug arrangement of stones and their soft, soothing hues are visually lovely, while the brightness of the piece, the glaring white stones against the dark background keep the dynamism up and refuse to let the piece be passed over as passive wall decor. 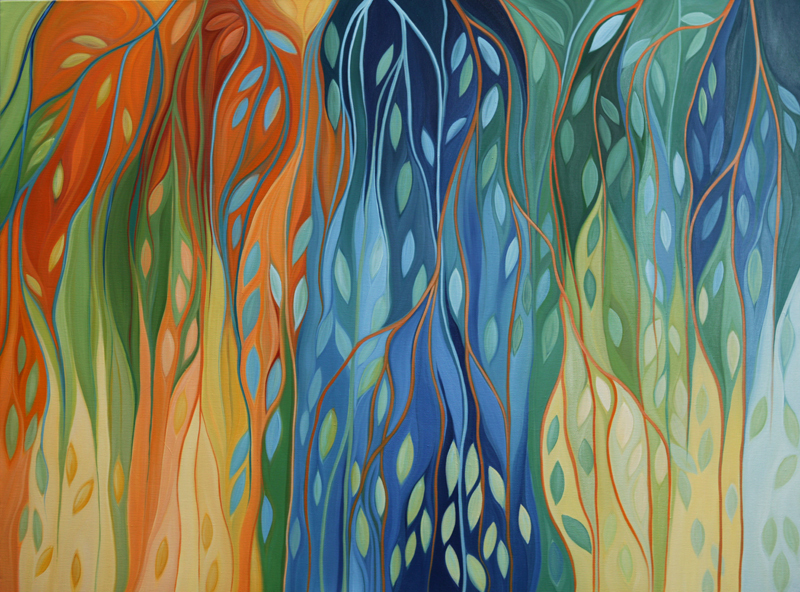 Frolic brings in more abstraction to Eastman's canvas, though it maintains the artist's foundation of fascination with and respect for nature. The bright color patterns call to mind those often found in many Latin American cultures as well as in those found in India, the Middle East, and Africa, but still the piece steers away from being an expression of any single culture. Rather it's a study of contrasting colors, brightnesses, depths, and an over-arching harmony, making it a piece that can be appreciated universally. Another point of interest is how the thin, vein-like branches multiplies the spatial patterns and imbues the piece with the silent wisdom and beauty that is often found in plant-life. The wavy lines call to mind the lines of the human form, including those in long, luxurious hair. "There is something magical about God’s creations that inspire and intrigue me," Eastman says. "When I look at a blade of grass, or a leaf, or a branch on a tree I first observe how simple that creation is, but that it is a part of a more complex whole and that relationship fascinates me. My images are based on more of a stylized view of these elements and the shapes and lines come from the nature that I observe around me. And yet I know everything comes from my subconcious and I think that I really am painting in order to work something out that may be going on in my life, some abstract concept, or a lesson that God is trying to teach me." Eastman's Mountain Top Series is special in part for its dream-like stylization of mountainous terrain. The sky is depicted as a billowing sheet of light and color, making even distant vistas feel close and rich with warmth. 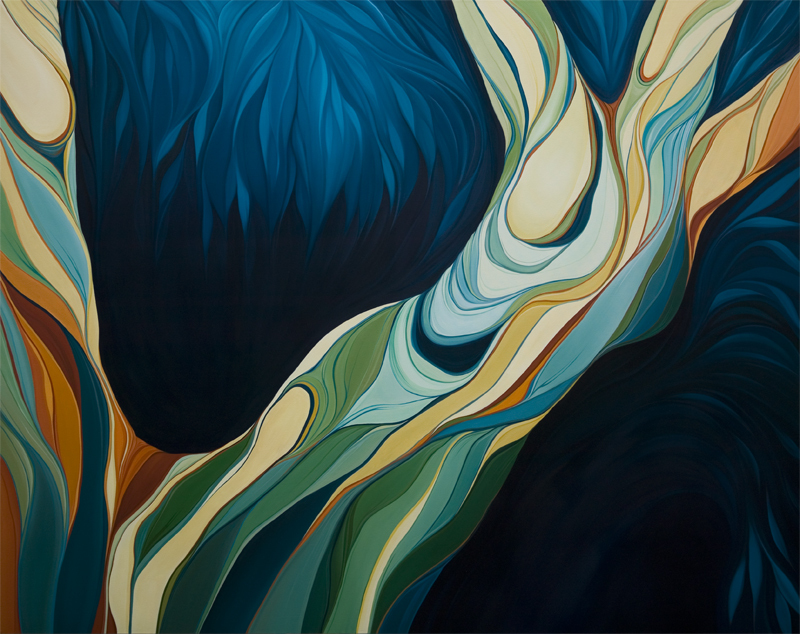 Eastman's ability to find the abstract splendor in nature is partly enriched from her up-bringing in the mid-west, as well as from her love of Georgia O'Keefe's work. "I am a mountain girl at heart," says Eastman. "I grew up in Idaho and Colorado and I never feel closer to God than when I am standing on the top of a mountain looking out over his magnificent creation! 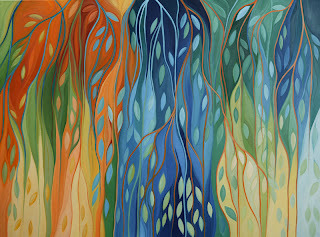 Georgia O'Keefe is my favorite painer, and I am also inspired by Wayne Thiebaud, Wolf Kahn for his amazing use of color, Gustaf Klimt, and Kandinsky. There are lots of others too, but those are my top." Eastman's Arborescent Goddesses Series is a pure delight, tastefully furthering her powerful identification with nature. Special points of interest are in the goddesses' gorgeous robes and in how they are lit. Nike seems to be boldy stepping forward from the background, even though she is a tree. A truly awesome and empowering piece! 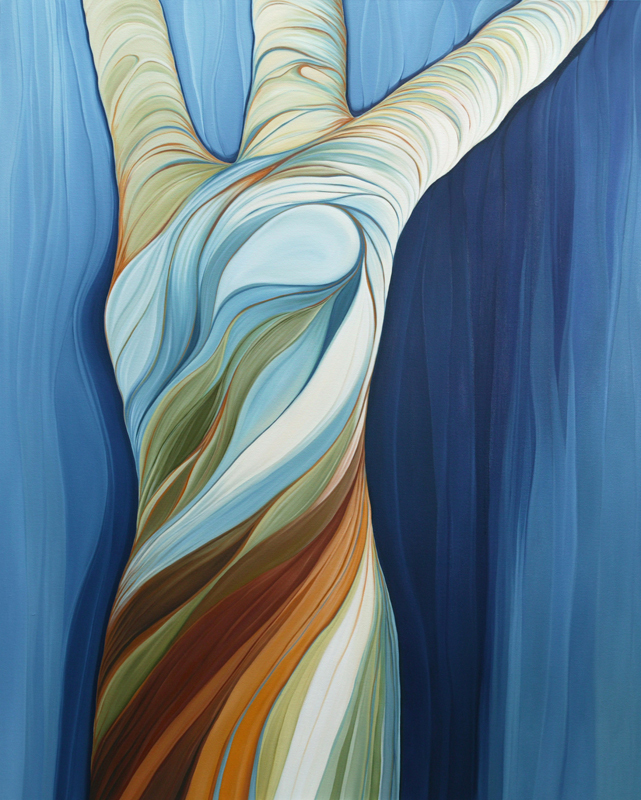 "The Arborescent Goddess series is my most personal. It really seems like each one of these 'ladies' is a self-portrait. I have incorporated the female form into the trunk of each tree. Every time I look at a tree I see a metaphor for a person. Trees can endure so much from the elements, disease, environmental factors, etc. yet they still stand. Sometimes you can see these “scars” on the outside, but they always seem to persevere. I tied this thinking to greek goddesses of mythology. Nike is the goddess of victory, and Daphne was running away from Apollo as he was after her virtue. At the last minute, Daphne was turned into a laurel tree." About the San Diego art scene, Eastman says: "Art in San Diego is starting to catch on. I have been doing the ArtWalk festival for several years now and it is getting bigger and better with customers getting more educated about collecting original art and understanding that buying art is about what you like, not what a gallery says is good or not. There is a lot of amazing art that doesn’t have to be outrageously expensive, and I think people are becoming more confident and independent in their choices. It depends where you want to go with your art." Amen, Karen Eastman. Let's hope art in San Diego continues to bloom, and that people continue becoming more educated, confident and independent in their appreciation of it. And thank you for doing your part!